Every Friday an organic farmers market sets foot on the Botermarkt square. It’s not too big, but it has everything you might want: vegetable stalls, a baker, flowers, cheese and things like herbs, nuts and even a stall that is specialized in different types of mushrooms. Unlike farmers markets I visited in cities like Berlin and London, this particular market aims itself mostly on people doing grocery shopping and less on eating things on the spot. Which is a bit of a shame, because I love wandering around and tasting a little bit of everything. Though, if you are staying in an apartment that is equipped with a kitchen, this market is a perfect place to get everything you need to prepare yourself a healthy meal. I have noticed a trend last summer with some food trucks popping up now and then. And these past few months you could buy freshly made organic stroopwafels (authentic Dutch treat: two thin waffle-like cookies holding some warm, soft caramel) from a nice guy in a cute little caravan. Hopefully this trend will develop into something more solid in the summer of 2015. I’ll keep you posted! 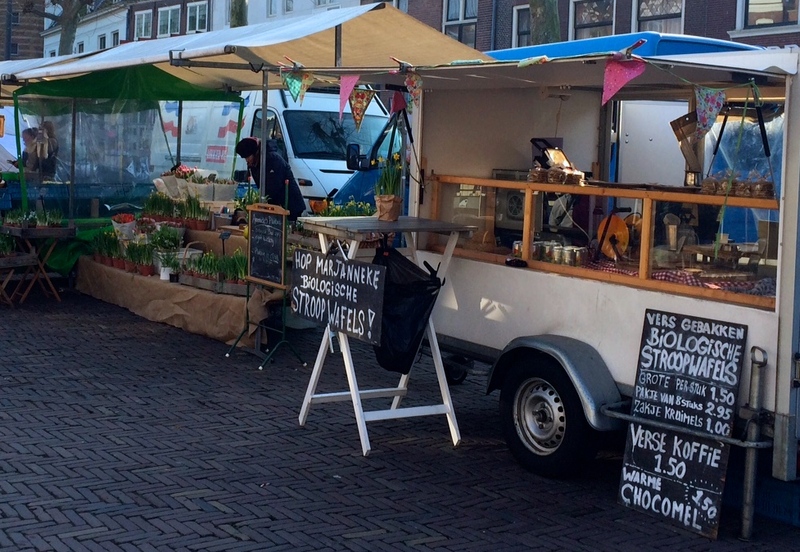 You can find the organic farmers market every Friday from 10-16 on the Botermarkt square.